Anyone who has ever driven into New York City knows just how hard it can be to find a parking space amongst the sea of sedans, trucks, SUV’s, and other vehicles taking a rest from trying to crawl through the Big Apple. Even finding a place to put your car in some of Long Island’s more densely populated towns can be a real challenge sometimes. Fortunately, researchers from MIT have partnered with Basque firm DenokInn to develop a car which will fit seamlessly into what would otherwise be exceptionally tight spaces. Slated for release in 2013, the HIRIKO is a compact two-passenger car with a hidden function that can solve the woes of many a driver- it transforms. Now this handy little car will not be morphing into a giant robot any time soon, and with any luck it will not be the cause of anywhere near the number of explosions as the Michael Bay franchise, but it does shrink into an even smaller car, making it all the easier to park. By folding its rear wheels underneath the main body of the car, the HIRIKO is further reduced from its already compact 5-foot length into one of the most easily stored vehicles in production. Those who hate parallel parking should be elated to know the car has one more innovative trick up its sleeves- its wheels feature zero turning radius and can even turn sidewise, which in turn makes it incredibly easy to squeeze into any spot. The HIRIKO is a purely electric vehicle and can travel up to 70 miles on a single charge. Though it probably won’t be seen traversing many lengthy road trips, the EV could prove perfect for day-to-day commutes and city-travel. Early estimates suggest the car may sell for a modest $16,000 when it sees release, making it much more affordable than Terrafugia’s up and coming transformer, The Transition (of course, a compact EV and a flying car probably aren’t catering to the same demographics). 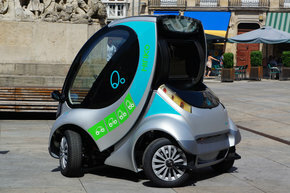 Barcelona, Berlin, and San Francisco will likely be among the first cities to receive the car, but there is not yet any official word that New York and Long Islanders should not expect an opportunity to buy a HIRIKO of their own. Looking for a compact car or an efficient electric vehicle? Leave a message below or tell us about it on the Long Island Lounge.